Spring means daffodils, tulips and the High Point Furniture Market! If you’re heading to High Point, we hope our paths cross at one of these exciting events. If not, follow along on Instagram to meet some talented friends and see the latest with Steve. Here’s a quick run down of the action, a Saturday floral arranging demonstration at 2pm with none other than Mottahedeh and New Growth Designs. Stop in and say hi! It’s a Friday 4 – 5:30pm kick off of our tour of High Point Market with Belle by Cheryl Luckett Furniture Collection with Sylvester Alexander. We’re honored to be included in Cheryl’s fabric homage to Southern beaus, Steve Mckenzie, Madcap Cottage and Scot Meacham Wood Home. Love our Indigo Loop fabric on her settee! Delighted to be part of the ‘Dining by Design’ Designers! 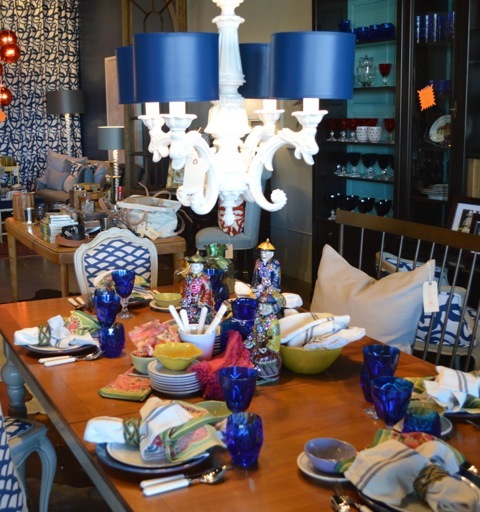 Join us on Saturday afternoon 4 – 6pm for the ‘Designer Celebration’ at Alden Parkes with partner, Replacements, Ltd. for some dazzling and divine table settings, floral arrangements, and more. If you’re like us, you’re tired of the traditional reds and greens of the holidays, and you’re over the gloomy grays and whites of winter… We’re in desperate need of color around here and our featured setting for our first Tablescape Thursday post is the remedy! We’ve taken pastels and made them especially timely with pops of rich Cobalt blue – a refreshing look after the holidays when you’re not quite ready for spring, but are ready for a change in hues for your home. It’s surprisingly easy to mix pastel colors with a steady stream of cobalt blue; even when not everything has that blue tone in it! 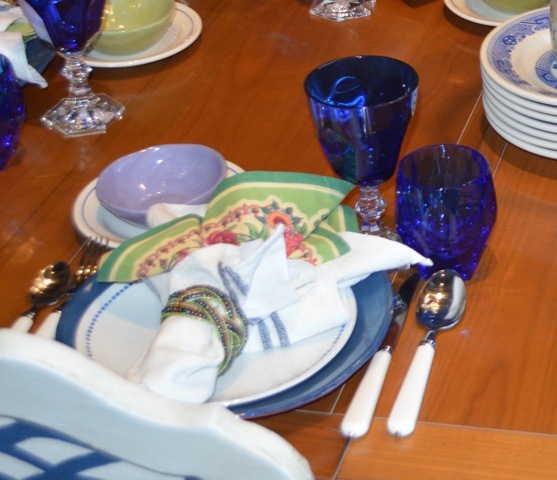 Our favorite R. Wood Studio dinner plate, in the Blueberry colorway, was the basis for our place setting, creating a cool contrast with the wood of the table top and crisp white of the salad plate, cloth napkin, and classic utensils. Additional pastel colors are worked in through these fun dinner napkins (steve mckenzie’s hostess tip: We believe in utilizing cloth napkins day in and day out; primarily from an environmental and comfort point of view. In addition, it’s fun to change your tablescape with seasonal napkins. Have everyone keep their napkin on their chair until it’s time to toss them in the wash). 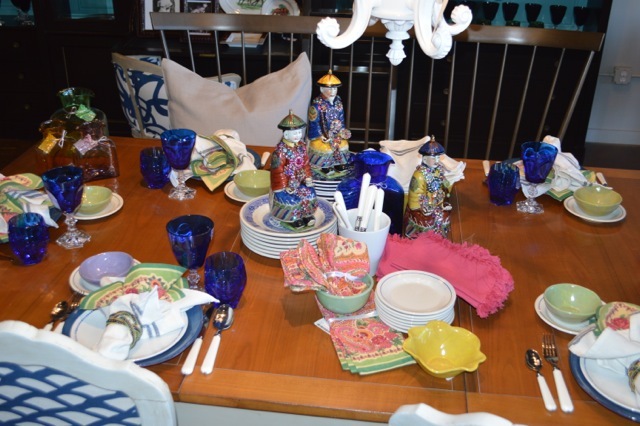 Another way to easily update the look of your tablescape isn’t on the table at all… Look up! 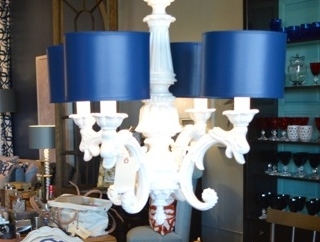 Consider updating your chandelier lampshades a few times throughout the year for a relatively inexpensive way to make a dramatic change in your dining space. We can help you create custom shades with fabric from steve mckenzie’s, or try Sunlighting Lamp and Shade Center for a fabulous selection of shades. Not only does this whymsical centerpiece add a touch of bling and flair, it also serves a purpose. 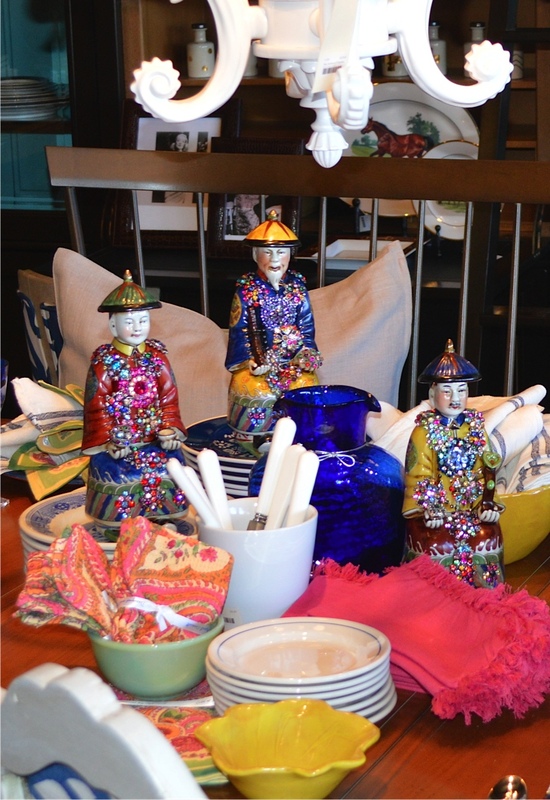 These unique Asian figures are perched upon dessert plates, making for a seamless transition to the final course of the meal. We hope these tips, suggestions, and product finds help inspire you to create an updated tablescape utilizing unexpected color combinations. We promise, it will give you a fresh perspective… Bon appetit!